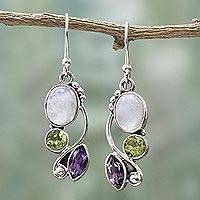 Regarded as the most mystical of gemstones, amethysts have been prized since ancient times - a favorite of Egyptian royalty and Catherine the Great. 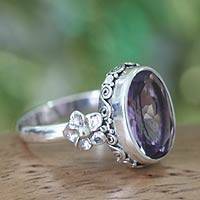 The British Crown Jewels are aglow with fine amethyst gemstones. I bought these earrings because of the purple amethyst stones. Purple is the color associated with the fight against pancreatic cancer. My husband's celebration of life is in a couple of weeks and we are all wearing purple, in his honor. These earrings are perfect! They lovely, dangly, and purple! 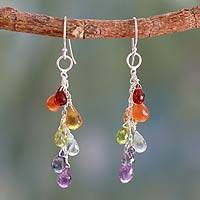 Floral Sterling Silver Amethyst Earrings , "Sunflowers"
According to ancient Greek and Roman myths, Bacchus, the god of wine, when in a drunken and angry state, swore to kill the first mortal he saw -- this mortal happened to be the fair Amethyst. Goddess Diana managed to save her by turning her into a beautiful white stone statue. When Bacchus saw what he had done, he poured his wine over her, creating a lovely purple stone. 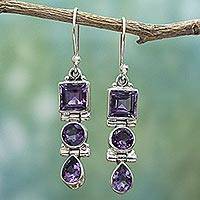 Jewelry designers from around the world contribute to Novica's selection of fine amethyst jewelry, including Nyoman Suarjana and Yuli from Bali. 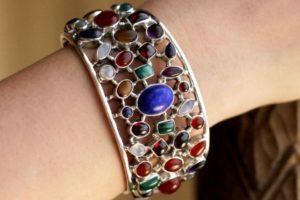 Their collections include amethyst bracelets, earrings and brooches surrounded by beautiful Indonesian accents. 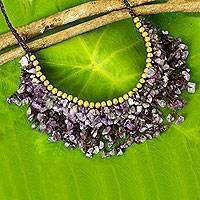 In Brazil, Gabriela Readi and Luciana Sodre create amethyst necklaces and rings that are bold and trendy, whereas Fanny Aguirre and Ilaria incorporate Inca stylizations into their designs. In Thailand, Lilly Rahmann designs amethyst necklaces and earrings that are original and chic. 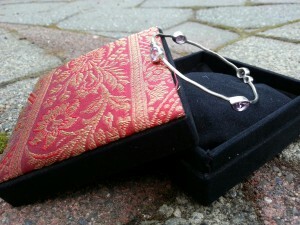 Neeru Goel's designs showcase amethyst in ornate Indian settings cast of sterling silver. 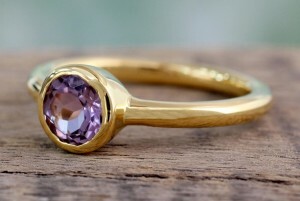 Amethyst is regarded as the most mystical of gemstones. 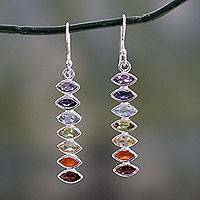 It is the birthstone of the Pisces-born, and the fourth and sixth wedding anniversary gem.